Butterfield & Robinson, the world’s premier active travel company, has reintroduced Australia to its portfolio with the unveiling of four, brand new active adventures, including a Sydney experience which is tailored to families. The trips are designed to immerse guests into Australia’s rich colonial history, spectacular scenery, stellar food and wine scene, and relaxed culture. Travellers can head to the untouched land and stunning landscapes of Tasmania; venture into the South Australian Outback for a quintessential Australian experience or explore the beautiful and charming city of Sydney. Alternatively, travellers can take on one trip in all three destinations for an opulent adventure through one of the world’s most diverse continents. 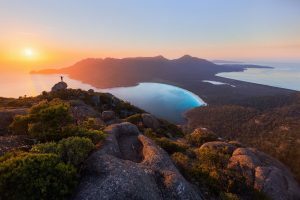 Rich in colonial history, spectacular scenery at every turn and abundant with scrumptious and fabulously fresh food and wine, the relatively small (by Australian standards) island state of Tasmania is regarded as one of this country’s most precious jewels. Here, guests will have plenty of opportunity to sample the local produce, explore the penal history and experience the wildlife on a magnificent four day adventure into the Australian bush. Including a walking journey over beautiful Maria Island, guests will uncover the wilder side of Tasmania whilst also learning about the island’s history. The state of South Australia is a one-stop shop for nearly all of the quintessential elements Australia is known for. Guests on this trip will experience endless Outback roads, witness the haunting Flinders Ranges, and cycle through fertile hills and valleys of some of Australia’s most famous wine regions, including the Barossa and Clare Valleys. From here, they will then hop on over to Kangaroo Island, where there is plenty of opportunity to get up close and personal with some of Australia’s most iconic land and marine creatures. Any trip to Australia inevitably starts or ends with time in Sydney, which many agree is amongst the most beautiful cities in the world. The white sails of the Sydney Opera House and the graceful curve of the Sydney Harbour Bridge will be the backdrop to this four day trip. Accommodation will be provided by the stylish Park Hyatt Sydney, which is nestled on the shores of Circular Quay, offering panoramic views over the harbour. From here, guests will explore the city in style, including a private two hour cruise of Sydney Harbour and a spectacular flight over the city to the sprawling fingers of the Pittwater and Hawkesbury River waterways. This trip has been thoughtfully crafted for families looking to explore Sydney and surrounding areas. On this trip, families will visit the stunning Blue Mountains; experience the sun, sand and waves at Bondi Beach with a private surf lesson on those famous breaks; enjoy a private cycling tour of Sydney, pedalling past the Opera House and over the Sydney Harbour Bridge; and spend the day learning about Australia’s iconic wildlife on a behind-the-scenes tour at Taronga Zoo. All four of these trips are suited to people who enjoy walking and cycling, and feel comfortable while on the move. Daily biking distances usually vary from 20 to 30 kilometres and walks are eight to 10 kilometres, with some longer afternoon options along the way.